Councillor Gill Taylor was elected Mayor of the Borough of Weymouth and Portland on the 17th of May 2018. She was born in Wigston, a suburb of Leicester but moved to the south coast when she was just 21 and worked at Poole General Hospital. Gill married in 1977 and had two children and a variety of jobs including lecturer at Weymouth College and also found time to study for a degree with the Open University. Remarried in 1999, Gill gained two more adult children and worked at the Centre for the Environment, Fisheries and Aquaculture Science for many years, retiring in 2007. Going on to stand for election in Westham West in 2008, Gill had a variety of roles on this council, latterly as Housing Brief Holder. Pastimes include reading fiction, doing embroidery and patchwork, plus a fascination for maths and mathematical puzzles. Past International President Wayne Madden from Auburn, Indiana, USA was elected president of Lions Clubs International at the association’s 95th International Convention in Busan, Korea, 22nd - 26th of June 2012. Past President Madden is an insurance agent and a certified insurance counsellor. A member of the Auburn Lions Club since 1984, he has held many offices within the association, including club president, zone chair, region chair, state council chair and District Governor. In addition, he is a past president of the Indiana Lions Foundation. He served as a District Governor-elect Seminar faculty member five times, as Campaign SightFirst II sector coordinator for Multiple District 25 and as vice-chair of the Global Action Team. In recognition of his service to the association, Past President Madden has received many awards, including the 100% Club President Award, Life Membership in the Association, the Senior Master Key Award, four Extension Awards, an International President’s Leadership Medal, 13 International President’s Medals and the Ambassador of Good Will Award - the highest honour the association bestows upon its members. He is a Charter W.P. Woods Fellow, a Kentucky Colonel, a Duke of Paducah, a Helen Keller Fellow and a Progressive Melvin Jones Fellow. In 2008, he was recognised for his humanitarian service by the governor of Indiana as a Sagamore of the Wabash - the highest honour the governor can bestow. 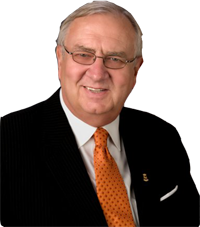 In addition to his Lion activities, Past President Madden has been active in numerous professional and community organisations, including as member of the Auburn City Council. Past President Madden and his wife Linda, also a Lion and Progressive Melvin Jones Fellow, have two daughters and five grandchildren.